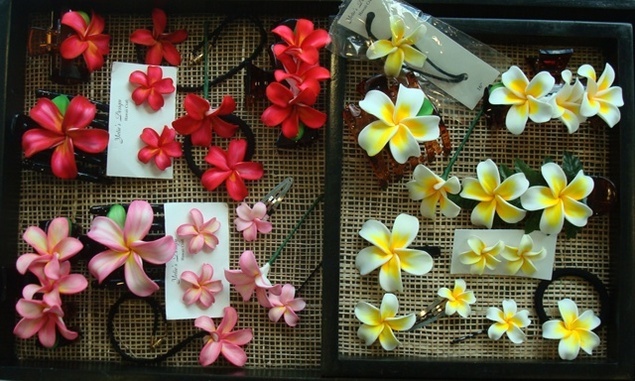 These hand-sculpted flowers are made in Wai’anae, on the west coast of O’ahu. The artist’s exceptional craftsmanship is clearly seen in each life-like petal made of superior quality FIMO clay. Please contact Robyn at (808) 949-7371 or E-mail robyn@lauhalatrading.com to place a wholesale order. 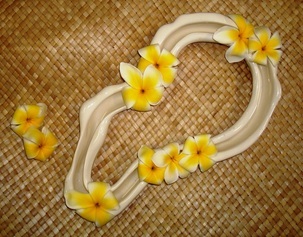 Beautiful, and durable FIMO clay lei and earrings. Made in Hawai'i. Hand-sculpted FIMO clay hair accessories and earrings. Top quality hair accessories ornamented with durable FIMO clay flowers. 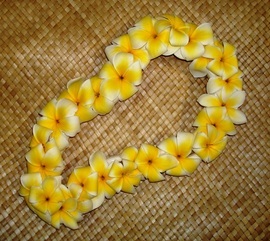 Each petal is meticulously shaped by hand. Beautifully hand-painted Christmas ornaments. Made in Hawaii.